Enjoy a 90-minute self-drive tour through Dresden in the official car of the DDR (GDR) with a live guide. Squeeze yourself behind the wheel of a Trabant of your choice and putter around the Saxon capital. See the most interesting sights and get your very own souvenir Trabant driver's license at the end of your tour! Jump into your very own Trabant and chug away through Dresden on a 90-minute ride in the official car of the DDR (GDR). 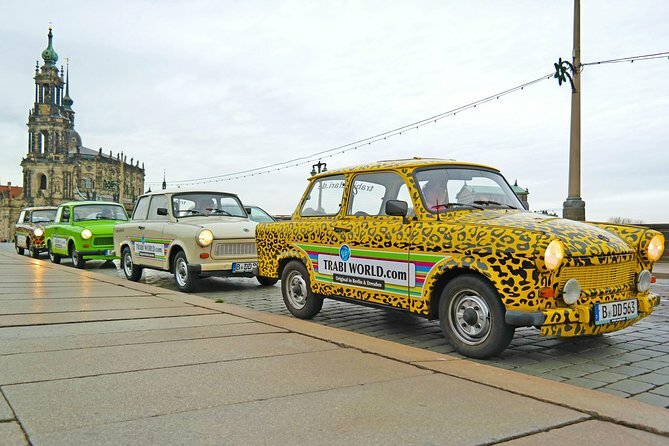 Join fellow travelers in a Trabant convoy and see the city like you've never seen it before during this Trabi Safari. Your live guide will be leading the convoy in the first vehicle. After a short introduction to the four-stroke and manual gearbox car, your adventure begins. Pass popular Dresden sights during your tour including Zwinger, Museum of Hygiene, Great Garden, 3 castles, Golden rider, Theaterplatz, Yenidze. Step back in time with the much-loved Trabi vehicle as you driver over the cobblestones of Dresden. Catch the "Trabi fever" and keep a souvenir of this unique experience: your very own Trabant driver's license! Self-drive tour in original Trabant vehicle (no automatic gearbox!